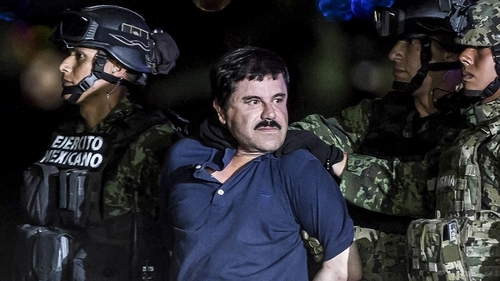 The world's most infamous cartel boss Joaquin "El Chapo" Guzman has been found guilty in a US court of drug trafficking. Jurors in a New York court convicted the 61-year-old guilty on all ten counts. He faces a possible sentence of life in prison. Guzman rose from poverty in rural Mexico to run a global drug empire and amass billions of dollars, becoming one of the major figures in the country's drug wars. He was extradited to the United States for trial in 2017 after he was arrested in Mexico the year before. The trial, which featured testimony from more than 50 witnesses, offered the public an unprecedented look at the inner workings of the Sinaloa cartel, named after the state in northwestern Mexico where Guzman was born. US prosecutors said he trafficked tonnes of cocaine, heroin, marijuana and methamphetamine into the US over more than two decades, consolidating his power in Mexico through murders and wars with rival cartels. His smuggling exploits, the violence he used and the sheer size of his illicit business made Guzman the world's most notorious drug baron since Colombia's Pablo Escobar, who was shot dead by police in 1993. Guzman's lawyers say he was set up as a "fall guy" by Ismael "El Mayo" Zambada, a powerful drug lord from Sinaloa who remains at large. Jeffrey Lichtman, a lawyer for Guzman, told reporters after the verdict that an appeal would be lodged. He said the defence team faced an uphill fight, given the amount of evidence the prosecution presented and the widespread perception that Guzman was already guilty. "This was a case that was literally an avalanche, avalanche of evidence," Mr Lichtman said. "Of course we're going to appeal". President Andres Manuel Lopez Obrador was elected last year after promising a change, suggesting a negotiated peace and amnesty for non-violent drug dealers, traffickers and farmers. They heard how Guzman made a name for himself in the 1980s as "El Rapido," the speedy one, by building cross-border tunnels that allowed him to move cocaine from Mexico into the US faster than anyone else. The witnesses, who included some of Guzman's top lieutenants, a communications engineer and a one-time mistress,described how he built a sophisticated organisation reminiscent of a multinational corporation, with fleets of planes and boats, detailed accounting ledgers and an encrypted electronic communication system run through secret computer servers in Canada. A former bodyguard testified that he watched Guzman kill three rival drug cartel members, including one victim who he shot and then ordered to be buried even as he was still alive. The most shocking allegation came from Guzman's former top aide Alex Cifuentes, who accused former Mexican president Enrique Pena Nieto of taking a $100m bribe from Guzman. A spokesman for the ex-president has denied the claim. In one of the trial's final days, Guzman told the judge he would not testify in his own defence. The same day, he grinned broadly at audience member Alejandro Edda, the Mexican actor who plays Guzman in the Netflix drama "Narcos".